In what is an obvious homage to Dickens, a young orphan by the name of Ren is adopted by a mysterious and charming man named Benjamin Nab. The two make their way around New England where lots of (illegal) hijinx ensue and eventually Ren discovers that he and Benjamin have more in common than he previously thought. 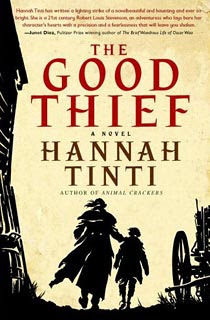 This debut novel by Tinti has been making the rounds in literary circuits by racking up tons of praise, but for some reason, I just didn't really enjoy this one. Maybe my problem with the novel was that I've gotten so used to serious fiction that I couldn't just lighten up. Though there are lots of Gothic images and sequences, Tinti does use a light tone when describing scenes and dialogue. But, I don't know, maybe I just don't find 12 year olds grave robbers or the thought of criminals prying teeth out of skeletons all that charming and lighthearted....Whatever, just an opinion.